Kyoto Protocol cooperation: Does government corruption facilitate environmental lobbying? Does environmental lobbying affect the probability of environmental treaty ratification? Does the level of government corruption play a role for the success of such lobbying? In this paper, we propose that a more corruptible government may be more responsive to the demands of the environmental lobby. We use several stratified hazard models and panel data from 170 countries on the timing of Kyoto Protocol ratification to test this hypothesis. 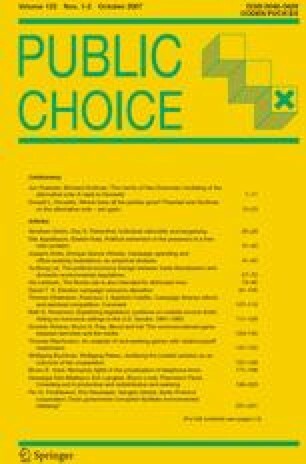 We find that increased environmental lobby group activity raises the probability of ratification, and the effect rises with the degree of corruption. Deacon, R. T. (1999). The political economy of environment-development relationships: A preliminary framework. Retrieved April 23, 2007, from University of California at Santa Barbara, Department of Economics Web site: http://repositories.cdlib.org/cgi/viewcontent.cgi?article=1089&context=ucsbecon. Fredriksson, P. G., & Ujhelyi, G. (2005). Political institutions, interest groups, and the ratification of international environmental agreements. Retrieved April 23, 2007, from Harvard University, Department of Economics Web site: http://www.people.fas.harvard.edu/~ujhelyi/ratify.pdf. Kaufmann, D., Kraay, A., & Mastruzzi, M. (2003). Governance matters III: Governance indicators for 1996–2002. Policy Research Working Paper No. 3106. Retrieved April 23, 2007, from World Bank Web site: http://www.worldbank.org/wbi/governance/pubs/govmatters3.html.